Nucleosomes are not only packaging DNA; their precise location on the DNA is also crucial for the ability of transcription factors and RNA-Polymerase to bind their target sequences and initiate transcription. In yeast the start of transcription is always bound by a nucleosome (+1 nucleosome), while the promoter region upstream of this start is free of nucleosomes. The +1 nucleosome is followed by an array of nucleosomes separated by regular spacings further along the gene (downstream). Genetic screens for genes involved in creating this nucleosome arrangement yielded a number of candidates. However, given the complex situation in vivo, the precise interaction of these factors, DNA and nucleosomes could not be studied. In order to define a minimal set of factors necessary for creating nuclesosome arrangement, Krietenstein and colleagues aimed at establishing this arrangement in in-vitro experiments. 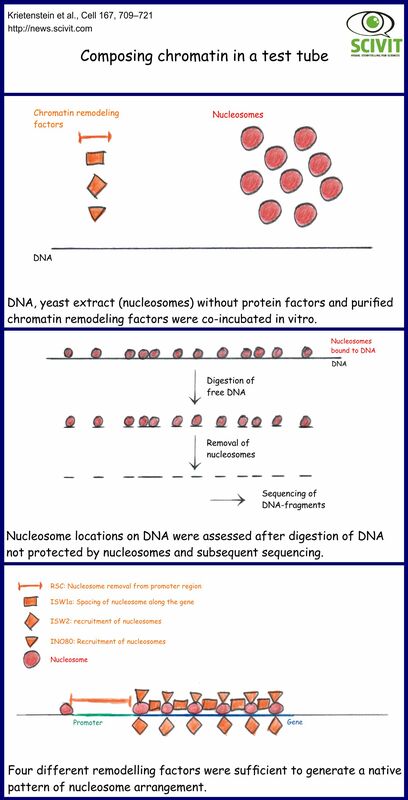 For such in-vitro experiments nucleosomes, DNA and various protein factors were incubated prior to assessing nucleosome arrangements. Such arrangements were analyzed by sequencing DNA protected by bound nucleosomes after enzymatic digestion of unbound regions. With their assays the scientists demonstrated that only four protein factors are necessary to correctly arrange nucleosomes at the start of gene transcription: The factor RSC is necessary for clearing the promoter region. The factors INO80 or ISW2 are necessary for correctly placing a nucleosome at the start of transcription and for recruiting nucleosomes further downstream. The factor ISW1, finally, establishes correct spacing of the nucleosomes binding along the gene.